The Department of Music’s artists-in-residence ensemble, eighth blackbird, received two honors at the 50th Grammy Awards held Sunday, Feb. 10 in Los Angeles. Another Grammy winner was U.S. Sen. Barack Obama, Senior Lecturer in the Law School, who won the “Best Spoken Word” category for the audio recording of his book, The Audacity of Hope. The contemporary classical sextet, which takes its name from the Wallace Stevens poem, “Thirteen Ways of Looking at a Blackbird,” is composed of Tim Munro, flutes; Michael Maccaferri, clarinets; Matt Albert, violin and viola; Nicholas Photinos, cello; Matthew Duvall, percussion; and Lisa Kaplan, piano. 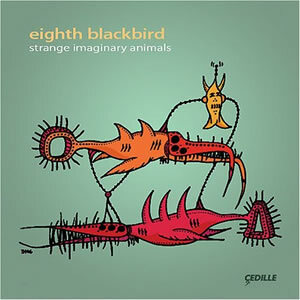 Hailed as ambassadors of new music, eighth blackbird has a growing reputation for its astounding musical versatility as well as its dedication to the works of today’s composers. The sextet is one of four professional ensembles currently in residence at the University. In addition to its Department of Music residency, the sextet participates in the University’s new music ensemble Contempo. Like the University’s other resident ensembles—the renowned Pacifica Quartet, the Newberry Consort, acclaimed for historically accurate performances on original period instruments, and the St. Paul Chamber Orchestra, which is widely regarded as one of the finest chamber orchestras in the world — eighth blackbird works with Chicago’s student musicians in sectionals, coachings and open rehearsals. The Grammy Award-winning eighth blackbird disc includes “Friction Systems,” a work by graduate student, David Gordon. While a student at Chicago, Gordon also has written works for the Pacifica Quartet and Contempo. For more information, including a complete list of upcoming eighth blackbird concerts and a chance to hear the group’s music, visit the ensemble’s Web site: http://eighthblackbird.com.